You Can Never See Me From the Same Place I See Myself (first view), 2013, mirrored glass tubes and paint, installation, 10’h x 15’ x 15’. 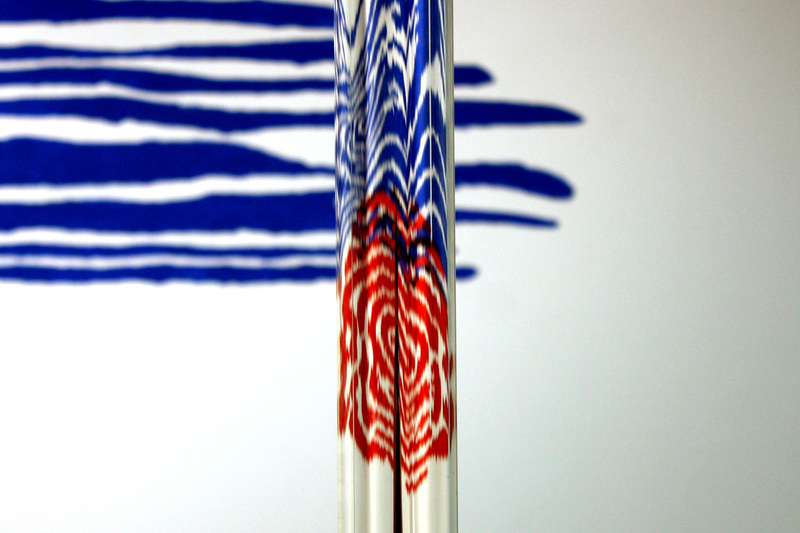 Two mirrored glass tubes standing in a painted space. While moving around in the space the patterning from the wall moves around in the reflection. You Can Never See Me From the Same Place I See Myself (second view, first tube view), in one of the two tubes, while standing in a specific relationship to the tube, all of the blue lines orient in the refection to form one image. The red lines form a distorted image. You Can Never See Me From the Same Place I See Myself (third view, second tube view), view of the other tube from the position where the red lines reflect to form a single image.